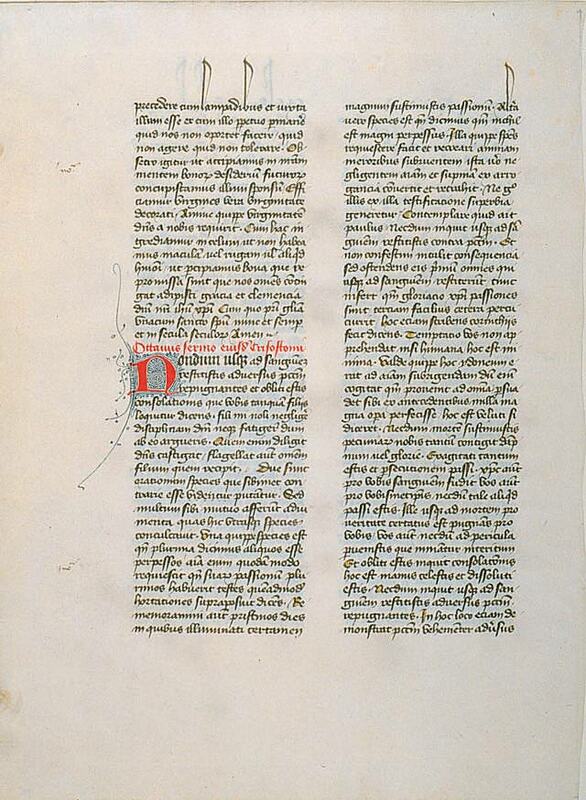 Text: This leaf contains the end of Chrysostom's Homily 28 on Hebrews and the beginning of his Homily 29 (Hebrews 12:1 and 12:4, respectively) (verso). A scan of the recto is not currently available. The translation is by Rev. Frederic Gardiner, via newadvent.org. ...to go before Him with torches, and to be near Him, and to be ever with Him, what ought we not to do? What should we not perform? What should we not endure? I entreat you, let us conceive some desire for those blessings, let us long for that Bridegroom, let us be virgins as to the true Virginity. For the Lord seeks after the virginity of the soul. With this let us enter into Heaven, "not having spot, or wrinkle, or any such thing" ( Eph. v. 27 ); that we may attain also to the good things promised, of which may we all be partakers through the grace and mercy of Jesus Christ our Lord, with whom to the Father together with the Holy Ghost, be glory, power, honor, now and ever, and world without end. Amen. Chrysostom's eighth sermon on the same. [Hebrews 12:4] "You have not yet resisted unto blood, striving against sin. And you have forgotten the exhortation which speaks unto you as unto children, My son, despise not thou the chastening of the Lord, nor faint when you are rebuked of Him. For whom the Lord loves, He chastens: and scourges every son whom He receives." [1.] There are two kinds of consolation, apparently opposed to one another, but yet contributing great strength each to the other; both of which he has here put forward. The one is when we say that persons have suffered much: for the soul is refreshed, when it has many witnesses of its own sufferings, and this he introduced above, saying, "Call to mind the former days, in which after ye had been illuminated ye endured a great fight of afflictions." ( c. x. 32 .) The other is when we say, "You have suffered no great thing." The former, when [the soul] has been exhausted refreshes it, and makes it recover breath: the latter, when it has become indolent and supine, turns it again and pulls down pride. Thus that no pride may spring up in them from that testimony [to their sufferings], see what he does. "You have not yet" (he says) "resisted unto blood, [striving] against sin." And he did not at once go on with what follows, but after having shown them all those who had stood "unto blood," and then brought in the glory of Christ, His sufferings, he afterwards easily pursued his discourse. This he says also in writing to the Corinthians, "There has no temptation taken you, but such as is common to man" ( 1 Cor. x. 13 ), that is, small. For this is enough to arouse and set right the soul, when it considers that it has not risen to the whole [trial], and encourages itself from what has already befallen it. What he means is this: You have not yet submitted to death; your loss has extended to money, to reputation, to being driven from place to place. Christ however shed His blood for you, while you have not [done it] for yourselves. He contended for the Truth even unto death fighting for you; while you have not yet entered upon dangers that threaten death. "And you have forgotten the exhortation." That is, And you have slackened your hands, you have become faint. "You have not yet," he said, "resisted unto blood, striving against sin." Here he indicates that sin is both very vigorous, and is itself armed. For the [expression] "You have resisted [stood firm against]," is used with reference to those who stand firm.